'El Chapo' Extradition Will Take At Least A Year, Mexican Official Says : The Two-Way On a morning radio program, the head of Mexico's extradition office also warned that possible legal challenges could delay the entire extradition process to the U.S. for four to six years. 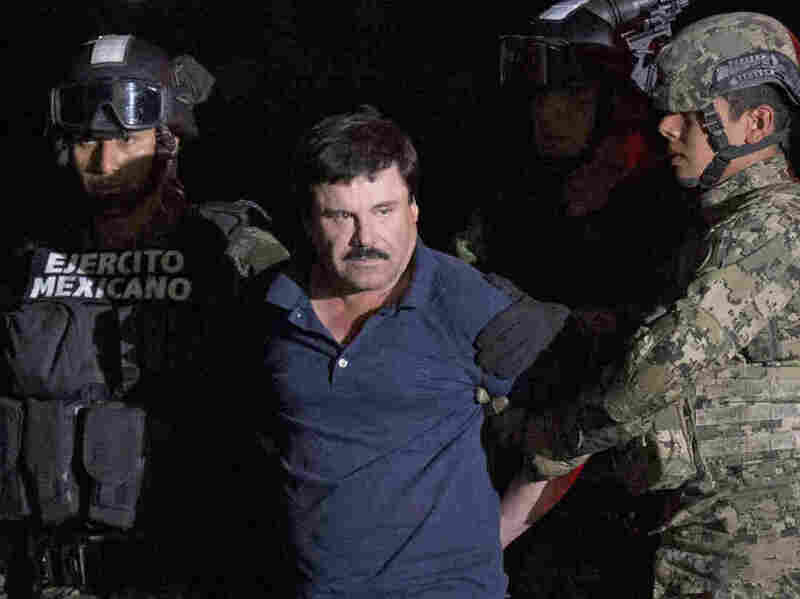 Joaquin "El Chapo" Guzmán was captured by Mexican marines on Friday. He now faces extradition to the U.S., though it will likely be a lengthy process. The extradition of Mexican drug lord Joaquin "El Chapo" Guzmán to the U.S. will likely take at least a year, according to the head of Mexico's extradition office, Miguel Merino. Speaking Monday on a Radio Formula program called Ciro Gómez Leyva por la Mañana, Merino said Mexico has begun processing two extradition requests from the U.S., but warned that Guzmán's lawyers could pursue a number of possible legal appeals that could delay the drug kingpin's extradition for four to six years. NPR's Carrie Kahn reports that Interpol officers presented Guzmán with two U.S. arrest warrants this weekend. He has been "indicted on drug and arms trafficking, money laundering and murder charges in at least six U.S. states," she says. Mexico's willingness to consider extradition marks a shift from the government's previous position, Carrie reported Saturday. When Guzmán was captured in February 2014, Mexico said it would not extradite him until he had served a lengthy prison term in Mexico. Mexican marines recaptured Guzmán on Friday. He had been on the run for more than six months following his escape from a maximum-security prison through a mile-long tunnel in July 2015. His recapture made headlines around the world, which were largely eclipsed the following day when Rolling Stone magazine published an October interview with Guzmán conducted by American actor Sean Penn and Mexican actress Kate del Castillo.